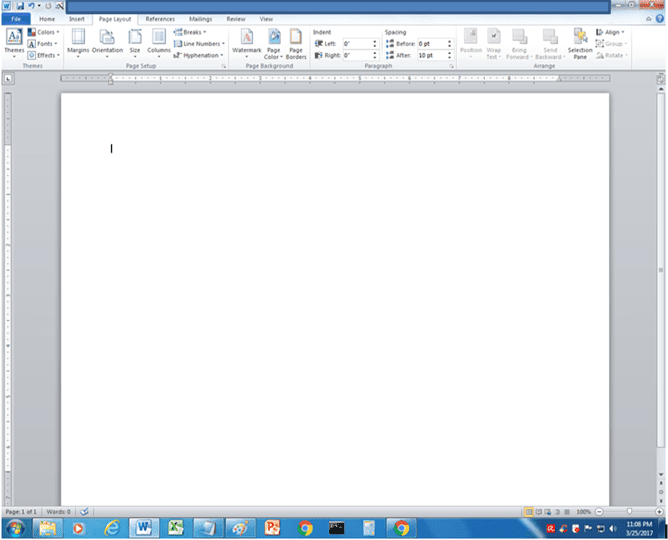 In creating any documents even it is offline or online application using a word processing application like the Microsoft Office Word 2010, you need to setup first the margins, paper orientation, and the most important of all is to select what size or paper size you need to use in your documents. Pending to create first with this application settings it has probably ruined the formation of your document's paragraph inside the document templates if your page setup set after you type-in your entire documents. 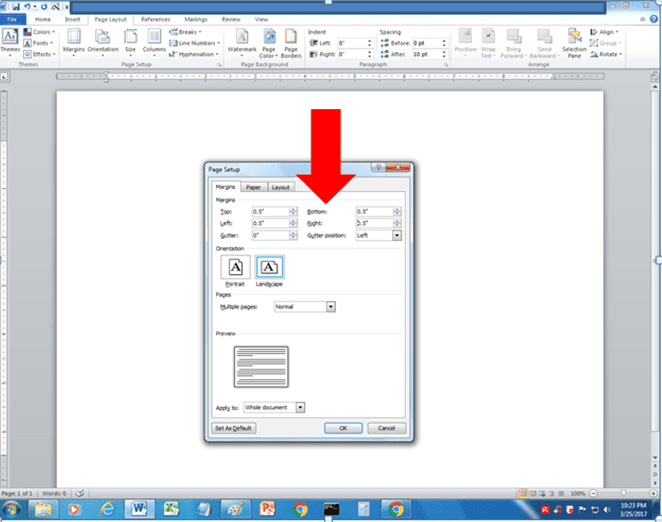 Follow the steps and look the images how to setup this setting for your documents before you start typing. PAGELAYOUT MENU- Is a main menu at the top commonly using to settings, themes, page background, paragraph, and arrange. You can use your keyboard key by pressing the ALT, then all the main menu it has a corresponding letter so that you can select a menu to use using your keyboard. 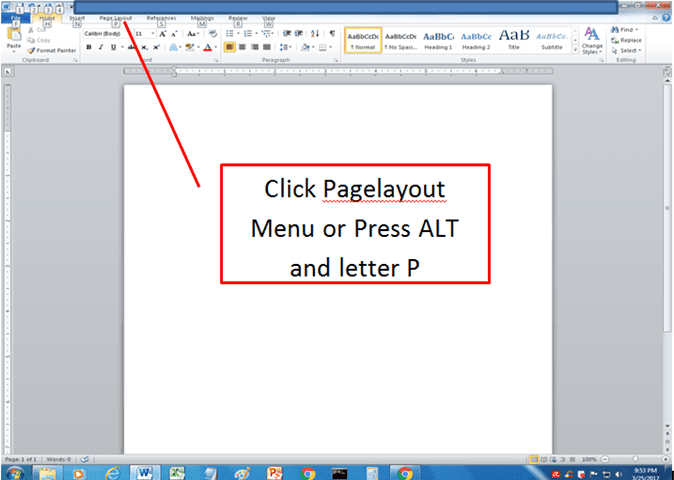 If you want to use your mouse simply click the page layout menu. To open the active window to setup margin you need to click margins ribbon, button after you click the PageLayout Main Menu or press on your keyboard the corresponding letter. 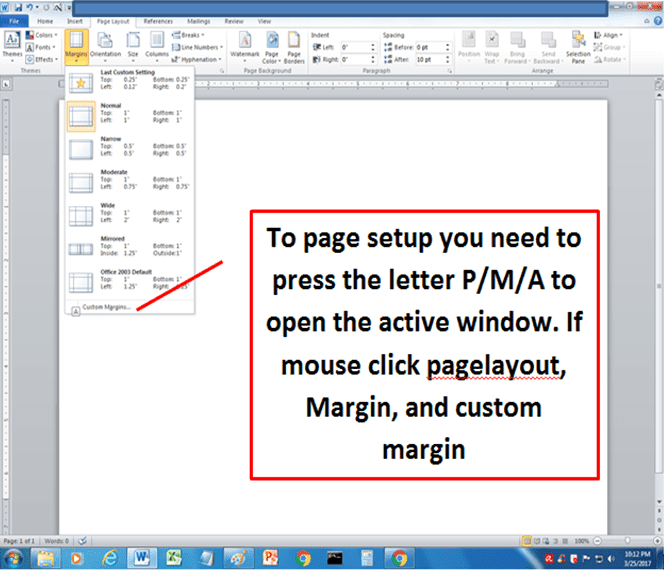 Then click custom margin or press the letter A to proceed. 2. 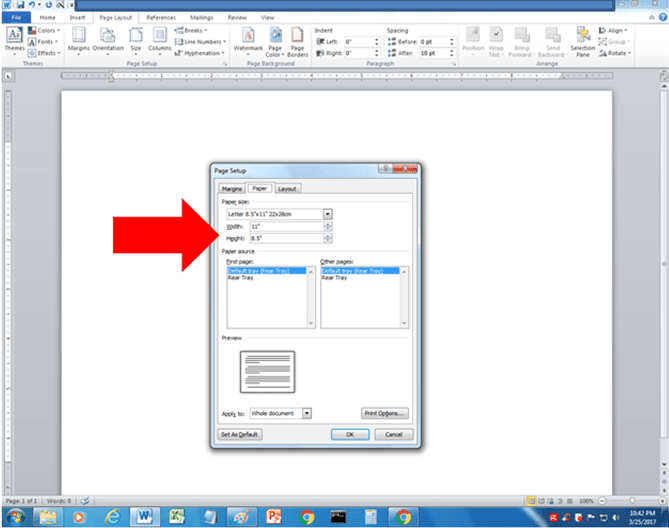 Page Setup- is an active window of 2010 version, it is the settings of Margins, Paper size, and layout of your documents. 3. PAPER SIZE- is the menu of active window of page setup, it's the sizes and type of paper you need to use for your documents. Paper sizes is also the type of common paper you use in your documents like 8.5" x 11" called letter size, 8.5" x 13" called Long band paper, and 8.5" x 14" called Legal which is the use of a legal document like MOA or any agreements needs to verify for signature for an Attorney. To select paper sizes you can click the down arrow back at the top right side. You select also the A4 and A5 band paper or other type and sizes of band paper after you click that down arrow bar. Other settings you need to set up in the above picture here is the layout, once you click the layout menu, you will see the header and footer settings that have a default size of 0.5 " if you want to change like 10" click and type your specific size. If you're finished all settings, click the OK button below of the active window. If you have questions, feel free to leave your message at the comment bar below this post.